Meet at: Cnr Anderson Street and Alexandra Ave (Royal Botanical Gardens) on the Morell Bridge. A cycling, learn to sail adventure day brought to you by Port Phillip BUG and Albert Sailing Club. A short bike ride to Albert Park Lake from Royal Botanic Gardens followed by a BBQ lunch on the deck at the Lake. 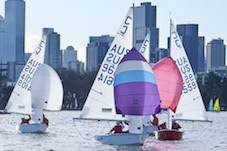 $12 pp $40 family includes lunch, sailing, instruction and concludes with a beach ride to St Kilda. What to bring: Money for drinks and clothers for sailing. What to wear: Sporty casual comfortable clothes, old shoes ,towel , jumper and sunscreen. Day/Time: Sun 27th September – 9.15am. Departure from: Cnr Anderson Street and Alexandra Ave (Royal Botanical Gardens) on the Morell Bridge. Prior to the trip it is a good idea to check your bike and make sure the tyres are well aired and the brakes are in good order . Bikes are for hire at the Ecocentre if you dont have your own.